JFHQ-NCR, J3 Directorate, Washington, DC. This picture was taken earlier this week at 6:46am. 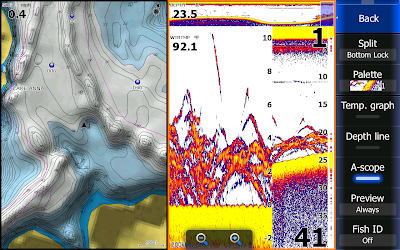 Sonar is on the left half of the page in a 30 foot scale, side scan in the upper right set on a 80 foot scale and down scan is on the bottom right side of the screen. I was searching for schools of Stripers running about 25 mph and located this school. If you look on the upper left in my history [between the 28. and the 1 in the digital depth] you can see what the school looks like when I am running fast. I turned the boat around, slowed down and had my clients start to deploy our downlines. I am just starting to come back into the school when I took this pic. 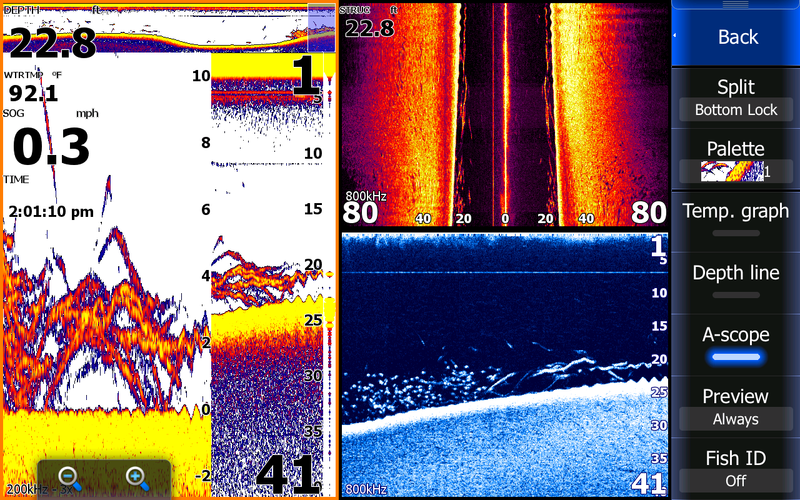 Notice in the side scan how there are more fish on the right side of my boat and also larger fish. This screen shot is one minute later after I turned my boat into the middle of the school. Needless to say we spanked um. This picture was taken in the afternoon around 2 o'clock. The water temp was 92* and I was working a breakline that came up onto a shallow flat. The black triangle in the center of the map is my boat. 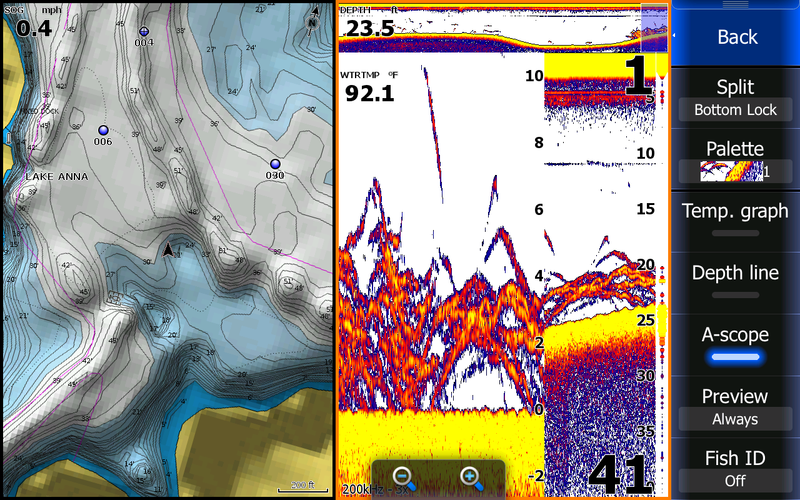 The grey on the map is water between 31 and 50 foot deep. The light blue is less than 30 foot deep. I was actually working the 30 foot breakline where the grey meets the blue when I located these fish on the ledge. Notice in my history I had been seeing them for about 40 yards. This picture was taken a couple seconds after the above picture. I changed the screen back to sonar plus scan. 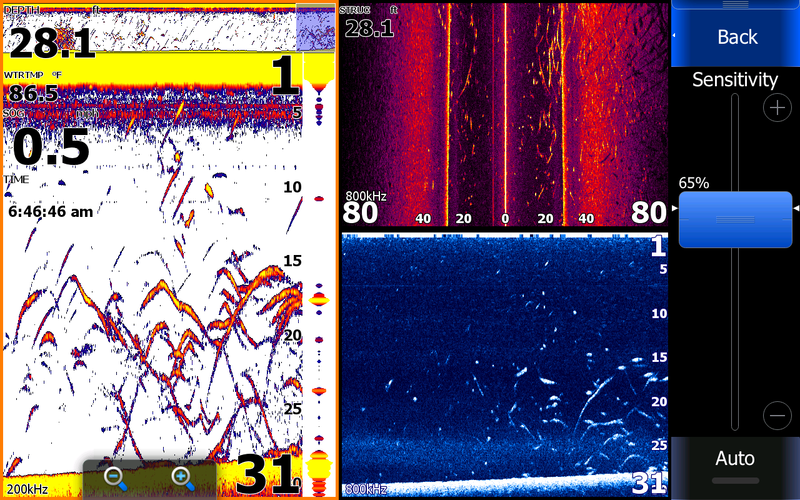 Looking at the blue down scan screen on the bottom right you can clearly see bait on the left and the shallower I got the more fish we got into. 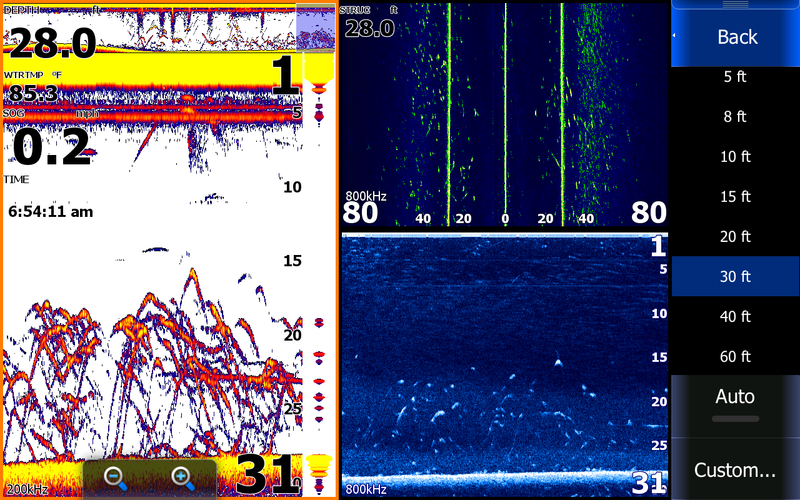 The Stripers had just fed on the bait and had busted the bait balls up over the shallower flat and the bait fled to deeper water to regroup into larger bait balls. 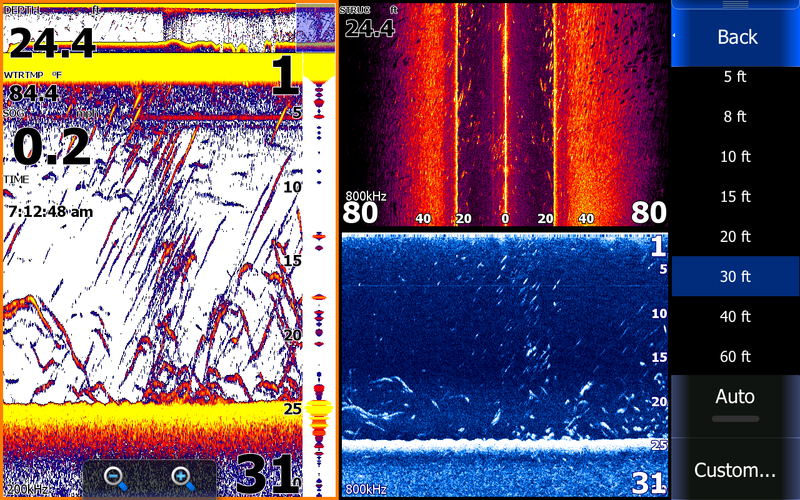 The sonar screen on the left is in split screen, the left side is on bottom lock zoomed in 3 times and the right half is sonar. These Stripers were hugging the bottom. This picture was taken this morning when we were over a school of Stripers. The school was trying to develop and had busted up the bait pretty well. 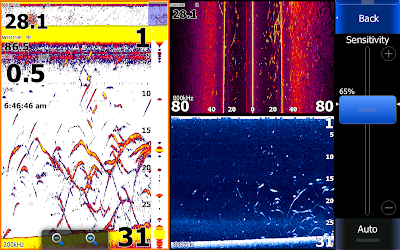 On the left sonar screen you can clearly see our bait being pulled through the school at 23 feet deep [The horizontal line]. This bait actually had been hit and was dead. 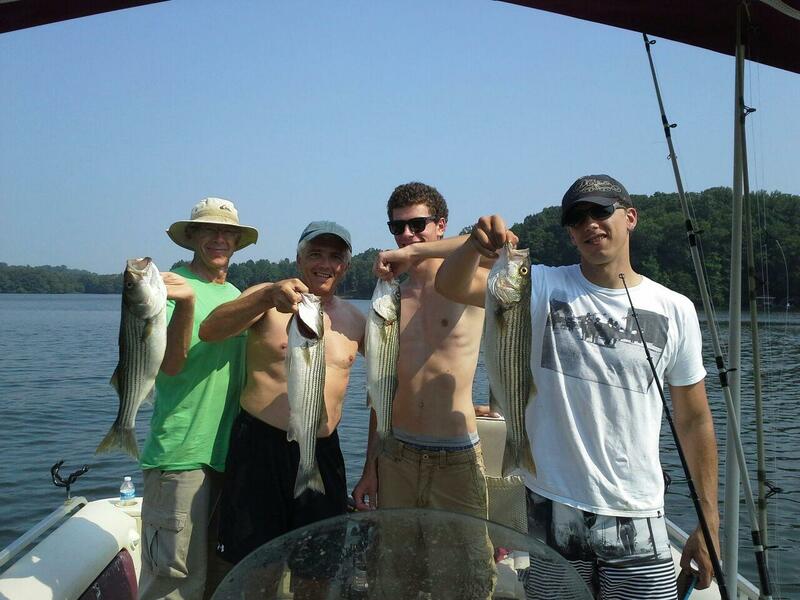 These fish were a mixture of keeper Stripers, punks and a few catfish mixed in. We popped 4 or 5 keepers out of this school before 7 or 8 boats busted us and spooked the school bad enough to bust it up resulting in us having to leave the area. 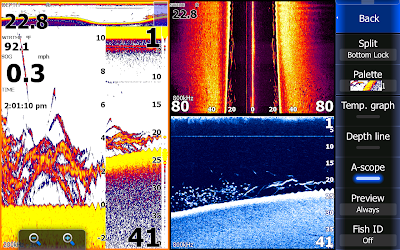 Hopefully some of those fisherman will see this posting and learn how to locate their own schools of fish instead of locating someone catching fish and selfishly encroach on other anglers. PS.....For everyone who is frantically trying to figure out where we were fishing in the third screen shot with the map, I will give you a clue. It is the second creek below the 208 bridge at the mouth where it intersects the main lake. The creek's name starts with a C. Where we are in that picture is not a particular spot, a honey hole, a go to area, is is SIMPLY one of thousands of places on the lake where the fish were using a flat to feed on and on this particular afternoon I caught them here. 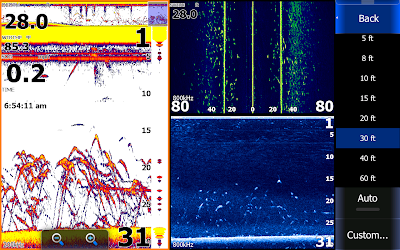 This is a text book situation where the fish had been feeding shallow and chased the bait off of the flat over the edge of the underwater point on the flat. Do you think after loosing that school of Stripers I checked out the other underwater point 100 yards to my left? Yea! 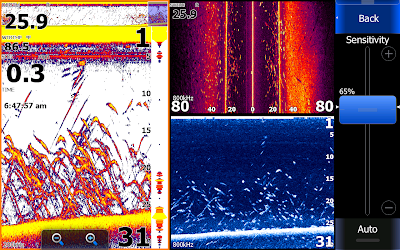 Most boats have decent depth finders on them, use them and be better fisherman. 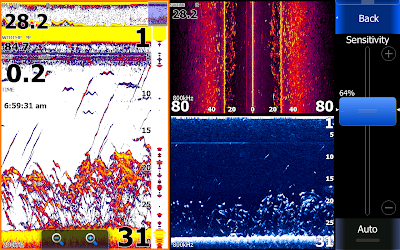 Fishing Lake Anna for Stripers or even largemouth is not difficult if you use your electronics to be your underwater eyes. 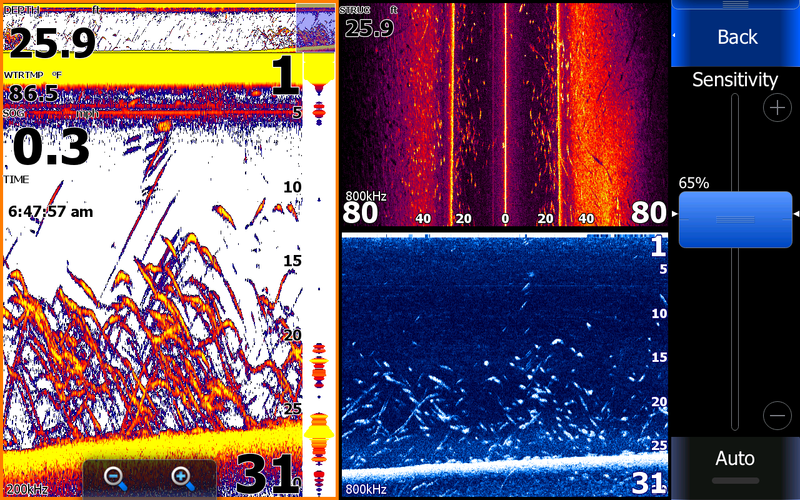 We catch a lot of nice Bass on similar structures. 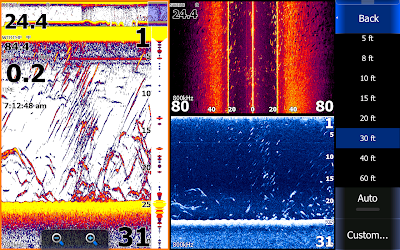 Keep your eyes on your Lowrance instead of on other boaters that may be catching fish and enjoy the thrill of locating and catching non pressured fish. Guide Charlie put his family on some very nice Stripers yesterday. 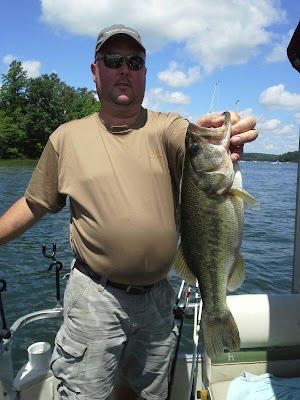 Charlie is a very knowledgeable guide who can take up to 3 anglers comfortably in his boat. He is available 7 days a week during the summer. Check out Charlies catch this morning! Today was Bob's birthday and his loving wife Connie wanted to do something special for him so she booked a Striper Charter for him. This was the first time this family had been out with me so they really did not know what to expect. I gave them instructions on how to deploy the lanes and off we went. I set up on a few fish for them to practice on which worked out well and they caught a few Stripers. I then looked for schools for over an hour not seeing much. We did find a large school of fish breaking but when we set up on them the fish would not bite us. Charlie was out today and called me to some fish he was working so we went to him and popped a few. We had taken over 100 hits by now so we went and caught more bait. I looked for another school for a few minutes but Charlie called me again and said he was on a school like I was this morning and not taking hits. I decided to simply put our baits out and keep the boat moving hoping to catch fish. Within a couple minutes we started hooking up catching Stripers with some Catfish mixed in. The decision paid off, action was not frantic but it was steady. We used up all of our baits and called it a morning. Today we caught about 50 Stripers and a dozen Catfish. Charlotte was the Catfish Queen today, but she also spanked the Stripers as well. Every time I looked at Bob today he had a big smile on his face. 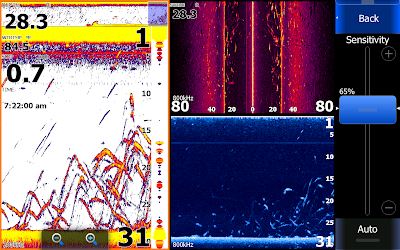 how to put their clients on Stripers. They will be back! 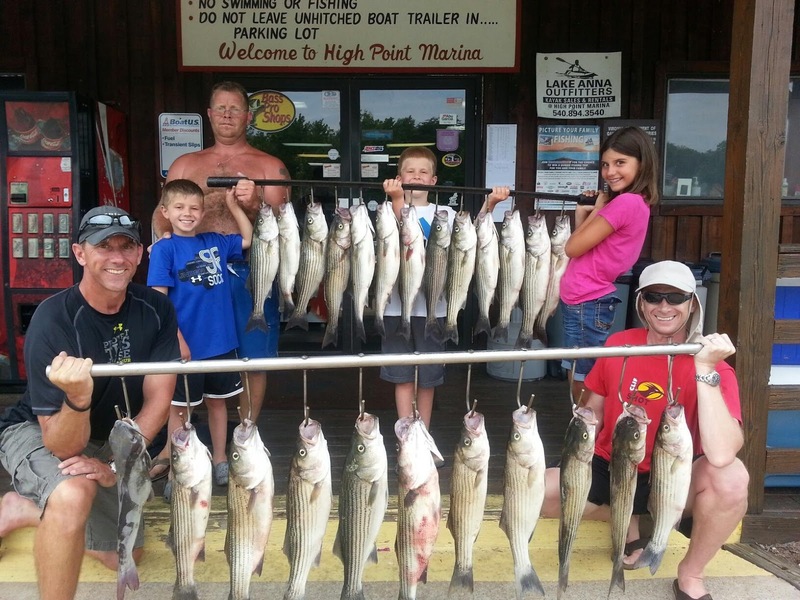 Today we had three guide charters on the Lake. I took out the Halbersma's, Tony took out Adam Bechtel and friends and Charlie took out Jim Matta and his friend. Tony burnt most of his baits up on schools of punks this morning before having to go catch more bait around 8 o'clock. My crew got a late start but we managed to have a lot of fun catching fish through out the day. If Anna would have stayed in the back of the boat instead of feeling sorry for Michael we probably could have doubled our catch. Michael had a monkey on his back today, he caught the first fish of the day which cursed him for the rest of the trip. Anna was catching Stripers two at a time. Charlie hung around me most of the morning picking off fish after fish. I know they had a good catch but he had been up for 30 hours straight and when he got off the water he turned his phone off and went to bed without sending me his picture. Although it was very hot today we all had great times catching fish. We caught well over 100 fish today. I caught bait early then picked everyone up at the marina at 5:30. Jalen was excited about today, not only does he love fishing but Gary and Loki have been out with me before so expectations were high for a good catch today. I set up on some fish early and about 15 minutes later the whole lake erupted. Fish were breaking for as far as you could see. We worked the Stripers for over a mile then left them while they were still busting on the surface! We hit 2 or 3 more schools before we had to go catch more bait. After catching bait we worked an area picking off a Striper about once every 15 minutes. Fishing is crazy for the first 2 hours of the day then the fish get full which makes it hard to catch much once the sun gets up in the sky and starts cooking you . Everyone had a great day and you can bet they will never forget today's fishing excursion. Tony took these clients out this morning and put them on some nice Stripers. A few days ago Johnny called me and said he has been fishing the lake with the same bait we are using and only catching a Striper or two a day and wanted to go out with us to help him improve his catches. I hooked him up with Tony yesterday and by the looks of the stringer they caught a few Stripers. Striper fishing will continue to be good for the rest of the month, contact us to get in on some of the action. Today Tony and I took out a group of Men that we take out every year. We woke up to pouring down rain and struggled to catch 130 baits each this morning by daylight. We picked everyone up at High Point and started their day on the lake. Tony had said that since it was raining he was going to take his crew and set up in one area hoping to take hits and not soak them. I told him I would keep on the big motor and look for schools. My guys probably were wondering what I was thinking about as I drove for 20 minutes through pouring down rain. Their patience paid off when I found a MAJOR school of Stripers. I stopped the boat, had them grab their rods and hollered for Tony on the radio to get down here now. He knew from the tone of my voice that I was on them and scrambled his crew to get their baits in and they flew to me. By the time they got to us and set down the fish were rockin. We worked the school till everyone ran out of baits, 260 hits! Tony and I went and caught bait and found 3 more schools of fish this morning and burnt them up. We ended up catching well in excess of 125 Stripers. 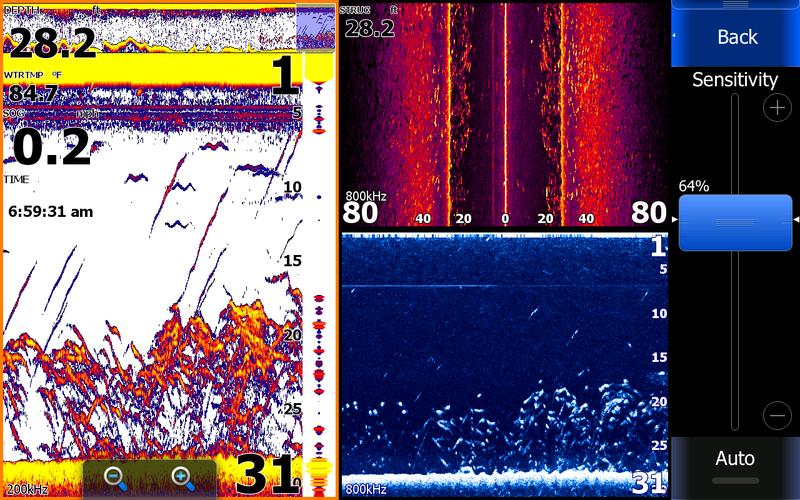 We also caught a couple nice Bass and 5 Catfish, one of which was a Citation Channel Cat. These stringers are representative of what we can catch in a morning on the lake if everyone listens to their Captains on how to deploy the baits and how to reel the fish in once they hook up. Needless to say everyone including Tony and myself had a great time this morning. A day like this couldn't happen to a nicer group of men, they have served our country well and deserve a good morning on the water. Tony and I caught bait again this morning then picked up our clients at High Point at 5:30. We were expecting an eventful morning since fishing was so good yesterday but we were humbled this morning. I looked for schools for a couple hours this morning while Tony set up on pods of fish but by 9am we only had caught a couple keepers. The fish simply would not school up like they had done for the last couple of weeks. We both had to catch bait a couple of times today which also was tough. I had a half day charter and Tony had a full day today. Right when we were ready to get off the lake Tony called and said he finally found a school. They banged them for about 30 minutes to save the day. 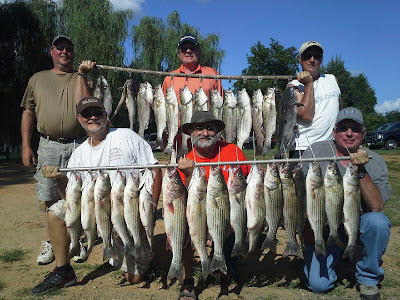 Even a bad day on the lake for us as guides is a great day of fishing for most anglers. Tony and I can't wait to get back out there and redeem ourselves. Troy, Karl, Thomas, Andrew and Madison with Tony helping hold the bar. Tony and I both had trips this morning so we got out on the water early and topped our tanks off with 125 baits each. We picked our clients up at High Point at 5:30 and hit the water looking for Stripers. I located a school, set up on them and took 20 hits in about 10 minutes but all the hits were short. I then went one way and Tony took off the other way to continue looking. I set up on a school and caught a dozen Stripers within a 30 minute span, all 19 1/2 inches. Tony was getting banged also but was getting punked as well. I had about 50 baits left in the tank and found a huge school of Stripers. We set up on them and within 15 minutes used up all of our bait. By now Tony was also out of bait and it was still before 7am. We both went to catch bait, I caught 80 in about an hour of throwing but Tony was had more difficulty locating the bait. I took what I had, found another huge school and burnt the baits up in less than 30 minutes. I tried to get Tony to join in but he wanted to top his tank off with bait before fishing. I made one more move and filled our livewell with our limits. Tony ended up having to catch bait several times today which paid off for his clients with a wonderful catch of Stripers. Everyone had fun today and left with smiles on their faces. Today was probably the busiest day of the year on Lake Anna. Tony had 6 clients today and got up early to have 2 tank fulls of bait and picked his crew up at 5:30. The boat traffic was horrible today as well as the fishing pressure. With every obstacle in Tony's path he rose to the challenge and put his clients on one of the best catches of the year of Stripers. With everyone on the lake boating and spooking the fish and all the Striper fisherman pressuring and dogging him he managed to put his clients on a truly incredible catch of fish today. 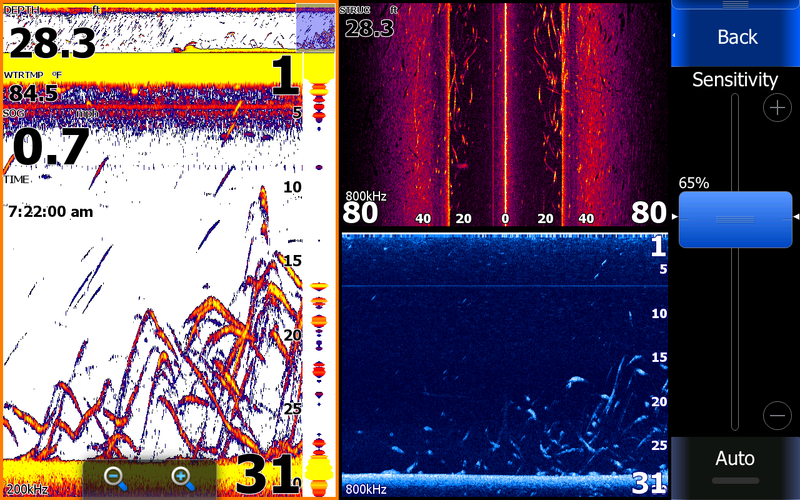 To figure out what the Stripers would do with the traffic today and to be able to hook up with the amount of fish that his clients caught is amazing. His clients probably caught as many Stripers as most of the Striper fisherman that fished today, combined. When most Striper fisherman and other guides are happy to come in after fishing a day like today with 4 or 5 fish Tony put his knowledge to work for him and gave his clients a day that they will never forget. This picture is of the fish they kept today, wonder how many they released? 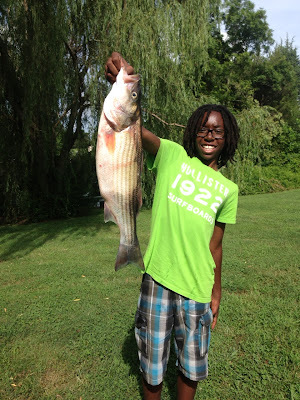 Shon is pictured holding a nice Bass he caught today. Tony took out the Kestler boys this morning on a half day charter in the rain hoping to catch some Stripers. Unfortunately bait was difficult this morning and they had to spend a good part of the morning catching bait. 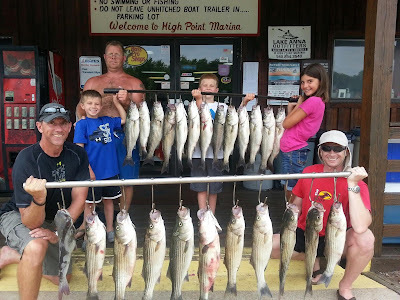 Once Tony had the bait he wanted it took less than an hour for them to catch their limit of Stripers. 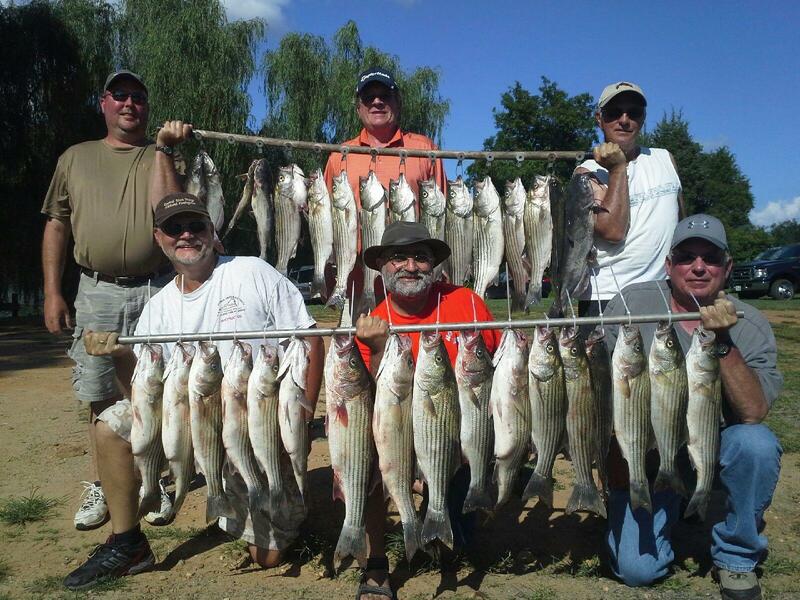 Tony turned a poor morning into a memorable fishing trip. Our guides continue to produce limits for our clients. Today DP had a trip and I took my grandson, Anthony, Dale and Doug. DP got out early to catch bait for his clients and we did not get out till mid morning. By the looks of the stringers we all had a great day despite the weather. The kids kept 20 Stripers as well as DP's clients. DP got off the water before the rain hit but we stayed out and fished in it. The boys were soaking wet and wanted to go in but on the way back in I ran over some Stripers and asked them if they wanted to try them. They all jumped up and before we got all of our baits in the rods bent over. Needless to say they did not even know it was raining for over 30 minutes.